Along with my photo buddy Doug Kaye, we attended most of the first day sessions – splitting up for a couple of the breakout sessions. Kelby Training produced the event and did a wonderful job. The venue, Yerba Buena Center for the Arts, was perfectly suited to the conference – a wonderful facility. Opening Keynote with Bradley Horowitz – Brad shared a lot of his personal background and how it influenced the work he’s put into helping lead the Google+ effort – and his delight at the response of photographers to the service. He didn’t have any new announcements or surprises to share – just the usual “watch this space” corporate talk. One of his points about future opportunities got me thinking: how it’s still too hard to sell stuff online. Hangouts with Trey Ratcliff and RC Conception – Trey and RC provided an intro to the two types of Hangouts on Google+ – private and “on air” along with what they’ve learned about using each kind. Trey mentioned the insights he gets into others from the backgrounds in their screenshots – kind of fun! 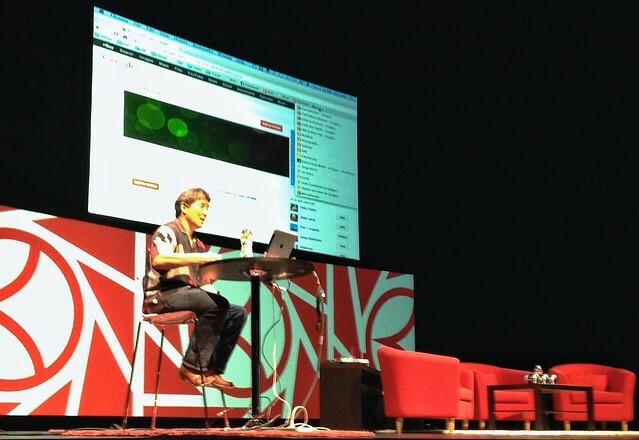 Building Your Brand with Guy Kawasaki (photo above) – Guy’s life these days seems focused on sharing interesting stories on all of the social media platforms – it’s core to building/sustaining the “brand of Guy”. In his talk, he shared how he finds interesting stories – relying heavily on his Alltop service, NPR, and a few other sites – and the tools and techniques he uses to post them to Google+. He’s a real believer in big images being very important so he doesn’t use the default linking technique but rather does a screen capture of images and then embeds them in his posts. They’re much more noticeable that way. He also shared his thinking about the comment stream and how he feels it’s important to share back with commenters whenever he can. Given that he’s got over 2 million users who have circled him, he gets a lot of comment activity! Art of the Head Shot with Peter Hurley – Peter gave a very lively (!) session on his techniques for taking great head shots. He talks a lot with his subjects and, in the process, gets them to open up to the camera in a natural sort of way. Fascinating – and lots of tips about how to make better portraits – something I’ve been trying to work on! App – the conference had its own app – for both iPhones and Android devices. The app provided schedule info, venture maps, messaging about changes, and a way to ask questions of the speakers. iPads – each session had an iPad dedicated to delivering questions in real time to the speakers. I’m looking forward to the day 2 sessions today – but will be participating remotely via the session Hangouts that will be broadcast all day. Thanks to Kelby and Google for enabling those! Thanks for sharing all that info, I hope they don’t forget the east coast. Previous PostPrevious How Do You Learn And Improve Your Photography?